Remembered on SINGAPORE MEMORIAL, Singapore. Column 60. Aged 25. Son of Mr. and Mrs. W. Ridgeon, of Brandon, Suffolk. Reginald’s birth was registered in Thetford, during the first quarter of 1919. His mother’s maiden name was given as “Snell”. 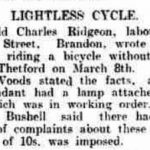 In March 1936 he appeared before local magistrates due to a lack of lights on his cycle. Reginald joined the army as a Territorial when the threat from Hitler’s forces loomed over Britain. As a Territorial he would have remained on UK soil, manning beach defences, training in warfare or even helping farmers with the harvest. When the threat of invasion diminished then the Territorials were directed to enter into the theatre of war. For Reginald and many other territorials from East Anglia, serving in the Norfolks, Suffolks or Cambridgeshires, this looked like being North Africa and Egypt. However as the Territorials were on the sea events took a turn in December 1941, when the Japanese bombed Pearl Harbor. Singapore now looked vulnerable, so the Territorials were diverted there. In February 1942 they landed with few weapons and within weeks had surrendered to the Japanese. Reginald was destined to spend the rest of his life as a prisoner of the Japanese. This was likely to be a false story, or at least the postcard was received many months after it was originally written. Just two months later Reginald was dead. There is evidence that Reginald “died at sea”, which may indicate that he was one of the P.O.W.s who were being transferred to Japan toward the end of the war. Many of the ships transporting the prisoners were mistaken for Japanese troopships and were attacked and sunk by Allied submarines. 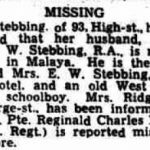 So it is possible that Reginald either drowned or died of illness while being transported. His body was never recovered or identified.